Yesterday I shared photos of tea sets I consider too fancy to use. 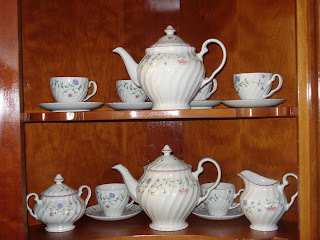 Today I am sharing an "everyday" tea set. This is Johnson Brothers Summer Chintz English china "every day ware." I have served many pots of tea to friends and family using these teapots. I found my first two sets of Summer Chintz trios in an antique shop in Durango, CO. Since then, I have purchased additional pieces online and at outlet stores. My daughter, Melissa, has been along on several of those shopping excursions. I currently have 8 trios, a creamer and sugar and 2 teapots. At what point is a collection complete? Is a service for 8 enough? Or do I need more to make it a service for 12 or 16? Oh my, decisions, decisions! Gorgeous! I would love to have tea from this!